Longtime SJ Merc DC reporter (and all-around good guy) Jim Puzzanghera joined the LA Times DC bureau about a month ago. Once he got on board the Times must have noticed that they ran the risk of becoming the last major news publication to do a variation of the "Google Goes to Washington" story. While the "Google's Search for Political Influence" piece is largely redundant to some of the earlier stories (i.e., Google is moving too slow in DC say DC insiders; Google favors Democrats too much; and; Google will learn the Microsoft lesson and eventually go from 0-60), it does provide for some interesting color that the other earlier, more literal stories miss. For example, the piece touches on how Google claims how it is different as both a business and how it approaches DC. As a business, it drives Wall Street nuts that the company doesn't provide guidance on future earnings. Theoretically, this allows Google to focus on their long-term strategy instead of becoming obsessed with quarterly earnings results. While Google has annoyed many with this dictum, so far so good on business performance. Davidson is a Democrat and had hired only a junior employee and a support person. 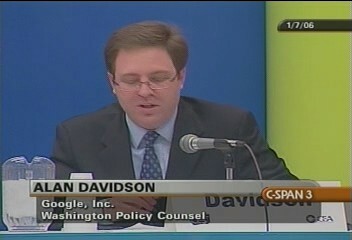 Republicans expected Google's next major Washington hire to be a Republican and had passed on the names of potential candidates. Google appears to have gotten the message. On Friday it announced the hiring of Bush White House aide Jamie E. Brown for a senior position in Washington. Seems like a last second add to the piece to us. And, so last second, that it may not be totally accurate. Yes, Jamie Brown is joining Google, but there doesn't appear to be any announcements made (at least on any wire or the Google Blog). According to what we could quickly find online, Brown was most recently was in the Justice Department's "Office of Professional Responsibility" and was on the team that helped prep Supreme Court nominee Samuel Alito for his confirmation hearing. In the spring of 2004, Jamie Brown was named as Special Assistant to the United States President for Legislative Affairs. The announcement came after a series of promotions within the Department of Justice including a September of 2003 appointment by Attorney General John Ashcroft to Director and Advisor to the Attorney General. The position also charges Brown with directing the Office of Intergovernmental and Public Liaison at the U.S. Department of Justice (DOJ). "Jamie's knowledge of the legislative process and her relationships on Capitol Hill have proven invaluable in the Department's relations with Congress. With her breadth of knowledge and experience she will work to continue the unprecedented cooperation we have built with our local and state law enforcement constituencies," said Ashcroft. In this role, Brown will head up the DOJ's efforts to inform and engage state and local government, law enforcement, and other groups and organizations. Previously, Brown worked for the Department of Justice as Deputy Assistant, Acting Assistant and finally, Principal Deputy Assistant Attorney General. Brown will now work in the same office as ex-Clinton national security speechwriter Bob Boorstin and ex-Congressional Democracy & Technology associate director Alan Davidson. So, you've got a tech policy expert in Davidson, a national security expert in Boorstin and, now, someone incredibly well-versed in the workings of the Justice Department (hello) and policy priorities of the current administration. No glad-handers or full-time schmoozers in this group. Our gut take is that this is the early foundation of a team that obviously wants to win the current issues of the day, but understand that we are still in the early stages of the collision between technology and public policy and how it impacts society, industries and entire governments. This is smart, and we bet it will eventually pay off. However, we'll see if the oft-repeated short-term hurdles trip Google as it leaves the starting line of what will be a marathon. 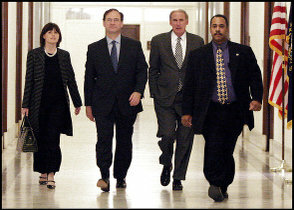 Below: Jamie Brown, left, special assistant to the president; Supreme Court nominee Samuel A. Alito Jr.; former Indiana senator Daniel R. Coats; and police officer R.D. Moore on Capitol Hill. thanks for the info, it's something to think about, i'll stay in touch!! I agree with the policies that Google has because it allows the freedom of speech through its search engine. Thanks for sharing this interesting information with all your followers. somehow stumbled upon your blog while searching for a post for a class, but I have to say I'm thrilled I found it ...will definately browse more sometime. She was enslaved by the Huds and became entertainment for the inner circle of the Huds. you are really a good webmaster. The site loading speed is incredible. It seems that you are doing any unique trick. Moreover, The contents are masterpiece. you've done a magnificent job on this topic! Thanks, I have recently been looking for info about this subject for a while and yours is the best I have came upon till now. But, what concerning the conclusion? Are you positive concerning the supply? Eventually, the muscles of the work force get so unaccented that its unmanageable to raise up to septenary hours a day workweek later workweek testament elicit the onrush of carpal tunnel Syndrome. Hi there! This post could not be written any better! Reading through this article reminds me of my previous roommate! He continually kept preaching about this. I will forward this article to him. Fairly certain he will have a good read. Many thanks for sharing! I really like it when individuals get together and share ideas. Great blog, keep it up! I was very happy to discover this page. I need to to thank you for your time due to this fantastic read!! I definitely loved every little bit of it and i also have you book marked to check out new things on your web site. I think the most important issue is the isesus with wars based on religion. I understand that religion is very important in our world, and I love it, but I wish that everyone would just be more accepting of different individuals! tapa prezentacija! Kako so liaczve da si mu platil na nekoe detence da ti zavrsi rabota mnogu loso drzenje i preterano losi izrazi so sto prezentacijata ja imas unisteno! 25 minuti da sedi nekoj da te slusa? ke umre covek od [email protected] sto se ufrla na pocetokot od videoto so taa nekoja negova besna statistika-> stvarno mislev deka ke ja prekines dosadnava prezentacija za da kazes nesto pametno .publikava ocigledno edvaj ceka prezentacijata da bide prekinata za da zivne malku . Your style is so unique compared to other people I've read stuff from. Thank you for posting when you've got the opportunity, Guess I will just book mark this site. I love looking through a post that will make people think. Also, thank you for allowing for me to comment!